The Kpone Traditional Council (KTC) has called on the Tema Development Corporation (TDC) to, with immediate effect, withdraw or suspend the processing of documents for Oasis Lubricant Ghana Limited to build an oil tank farm at Kpone-Kokompe. The reason for the request stems from the fact that the proposal submitted to TDC and the Kpone-Katamanso District Assembly (KKDA) was to build offices for the company, and not an oil tank farm. Even though not a single permit has been obtained from any of the institutions responsible for the issuance of permits for such purposes, which includes the KKDA, KTC, TDC, Environmental Protection Agency (EPA) and the Ghana National Fire Service (GNFS) among others, three tanks have already been built on the proposed site. 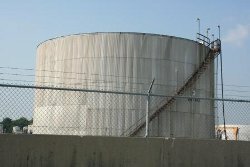 Another reason, for which the traditional authority is calling for the withdrawal of the permit, is that the land on which the oil tank farm is set up is within a residential area, an indication of the fact that in the event of any disaster, the environment, human lives, and properties would be in serious danger. This was contained in a two-page letter, dated September 24 and addressed to the Managing Director of the TDC, and signed by the Registrar of the Traditional Council, which was intercepted by The Chronicle. According to the KTC, several attempts to get the company to discontinue with its construction of the oil tank farm have proved futile, as management of the company is bent on continuing with the project. When contacted on phone, Madam Evelyn Acquah, project manager for Oasis Lubricant Ghana Limited, explained that as far as she was concerned, the KKDA, which is the authorised body in charge of issuing permits for the construction of companies offices among others, had already given a permit to her outfit to operate. She alleged that her company paid an amount of GH¢23,000 through the Acting Engineer of the KKDA, Mr. Vincent Yeboah, to the Assembly for the permit, an issue the District Engineer has denied completely. She, however, admitted: "We are yet to get [a] permit from the Environmental Protection Agency (EPA) and the Ghana National Fire Service (GNFS), which is still in the pipeline." Denying the allegation, Mr. Vincent Yeboah noted that it was never true that any permit had been granted to the company to operate for such an amount of money. "We have two kinds of permits we give out, one from the government acquired area, and the other from the non-acquisition area. "As an Assembly, we work on the government acquired areas, and permits are approved by the Statistical Planning Committee of the Assembly, which is chaired by the District Chief Executive, therefore, an individual, town planner or the engineer does not have that right single-handedly to give out [a] permit," he explained. Mr. Yeboah continued that the final approval would be jointly granted by the EPA, KTC, KKDA and the GNFS, until then, whoever is found working on that parcel of land would be arrested by the police. You have shared a nice article here about the Oil Tank. Your article is very informative and I really enjoyed reading it. The Oil Tank Gauge is very useful to see the level of oil in the tanks.